1. Following close on the heels of their Platt LePage XR-1 / XR-1A Anigrand's latest in their excellent series of prototype rotary-winged aircraft is #AA-2063, the Bell Model 409 / YAH-63 attack helicopter. This was Bell's entry in the 1972 US Army Advanced Attack Helicopter (AAH) competition, where it eventually lost out to the Hughes YAH-64 Apache. 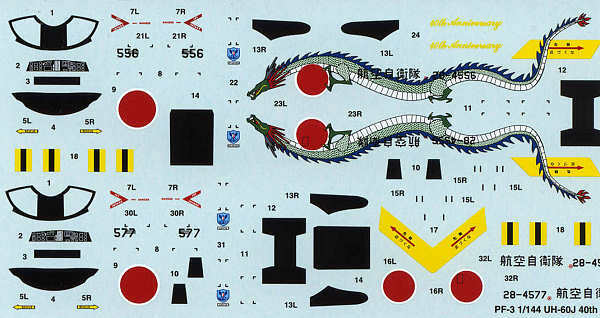 This 1:72 kit has 51 resin parts, all well up to the usual standard, plus the vacform canopy and a decal sheet that gives alternative markings for both prototypes. 2. Platz have released another version of the JASDF UH-60J in their 'Rescue Wings' series. This one is #PF-3, and comes with the same double set of clear plastic and etched steel parts as the previous issues (PF-1 and PF-2, HKN #220), but with a new decal sheet giving markings for a spectacular JASDF 40th anniversary scheme featuring a dragon which runs along the length of the fuselage. 3 Italeri's 1:48 ACH-47A Chinook #2647 is not just an upscaled version of their 1:72 kit; this one features 'highly detailed interiors' mostly inaccurate or just plain fictitious. However, the advent of the first injection moulded 1:48 Chinook has been widely welcomed, and there is much speculation on both the likely appearance of further 1:48 Chinooks from the same source, and on the aftermarket possibilities. Decals are provided for 64-13149 'Easy Money' and 64-13151 'Stump Jumper', as well as for 64-13145 in it's pre-delivery testing scheme. 4 Hasegawa are making two re-issue Apache kits in 'Iraqi Freedom' markings. 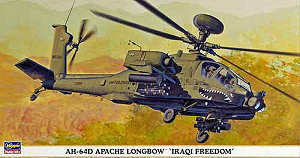 #00825 will be a 1:72 AH-64A, while #09698 is a 1:48 sharkmouth AH-64D Longbow and is available now. 5. Amodel have released a new version of their Kamov Ka-62, this time in 'Russian Civil Aviation' markings, #72049. (A Ka-32 with skis was shown in the Amodel 2001 catalogue with this part number, but it has never appeared). 6. 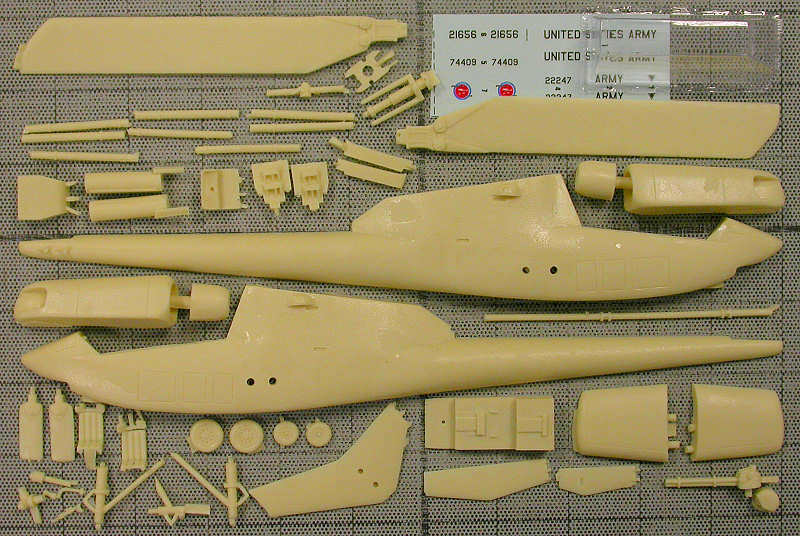 Fireball Modelworks are planning a new 1:72 resin external conversion set for the USCG HH-60J Jayhawk, including complete decals to build any Jayhawk in the inventory. 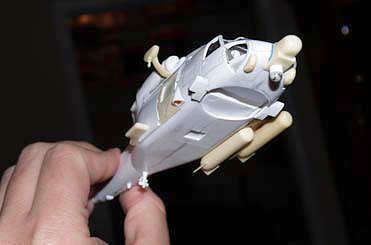 The base kit can be either the Hasegawa SH-60B or the Italeri HH-60H. 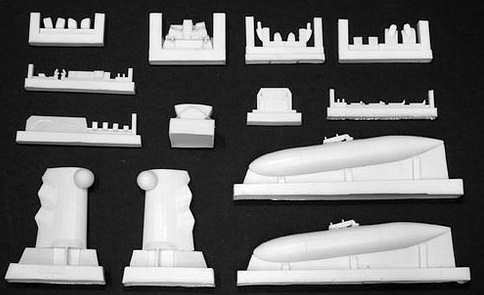 These photos show some of the pre-production parts and the way they look on the model. The decals will probably also be up-scaled to 1:48 and offered separately. Just released is "The Guardian", a new Kevin Costner movie about USCG rescue swimmers; maybe it will do for the Jayhawk what "Black Hawk Down" did for the MH-60 and Littlebirds. 7. A 1:48 IsraCast conversion set to make the IDF/AF AH-64D-I 'Saraf' is now available from IsraDecal. 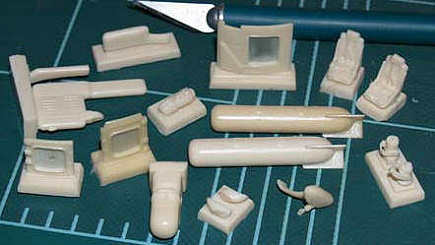 Set #IC48012 is suitable for the Hasegawa Longbow kits, and comprises 37 resin parts and a photo-etched sheet. A separate decal sheet #IAF-53 is also available, see HKN #218. Thanks to Shuuichi Manei and Joseph Osborn.